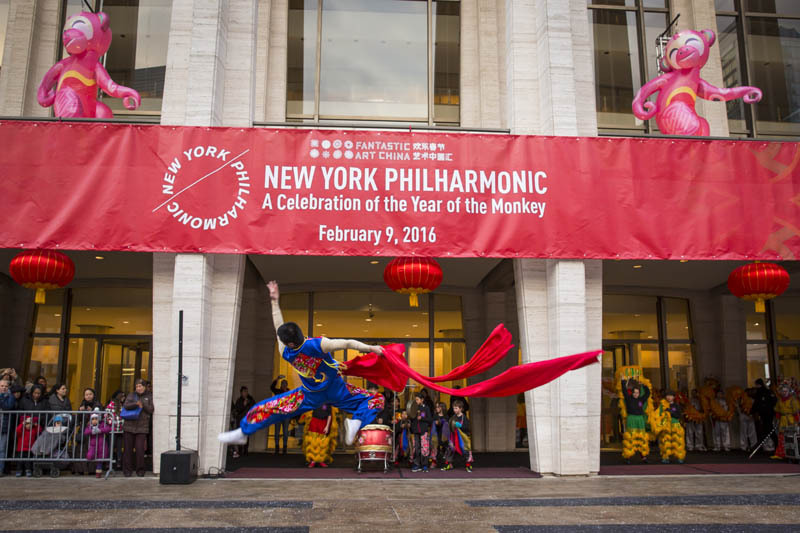 The New York Philharmonic in collaboration with CAMI Music, celebrated the Chinese New Year for the fifth consecutive year, this time welcoming the Year of the Monkey. 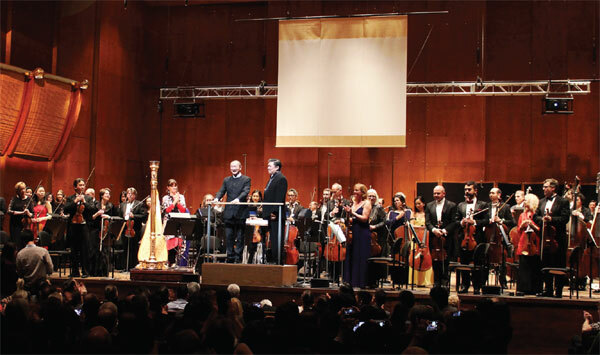 This year’s program featured Maxim Vengerov, a renowned violinist, performing Chen Gang and He Zhanhao’s “The Butterfly Lovers”, and music director of the Shanghai Symphony Orchestra and chief conductor of the China Philharmonic Orchestra, Long Yu. Before the concert began, Honorable Ban Ki-Moon gave an inspirational speech wishing everyone a happy new year full of creativity and peace. The concert began with Li Huanzhi’s traditional work, “The Spring Overture” conducted by Long Yu. A short song describes joys and wonders of the spring season. The song is a wonderful depiction of the Spring Festival (Lunar New Year) with its energetic opening and joyful theme. The Spring Overture is a popular classic in China, performed with both European and Chinese instruments. “The Butterfly Lovers” is based on a Chinese folk tale, dating back to the late Tang Dynasty involving Liang Shanbo (a boy) and Zhu Yintai (a girl). Zhu Yintai ran away from home, disguised herself as a man and attended school for three years where she became close friends with Liang Shanbo. When she noticed that she was falling in love, she left the school. Liang went to look for his companion to discover that Zhu is a girl and that her father has arranged marriage with a wealthy man. Liang died from heartbreak and Zhu Yintai visited her grave where she begged the grave to open. A thunderclap opened the grave and Zhu jumped in. The two lovers than emerged as butterflies. The first part begins with the solo violin in duet with the cello, depicting the mixed of feelings of happiness and sadness. The second part transitions to the deep sounds, bassoon, double bass, gong, to reflect Zhu’s defiance to the father arranging her marriage. The violin and cello duet reflecting Liang’s heartbreak and Zhu’s sadness. The last part transitions with a loud percussion crash, to depict the opening of the grave and ends with the harp and flute as the two lovers are reunited as butterflies. “Tambourin chinois” a composition of the violinist Fritz Kreisler, is a unique piece of work. Unlike his other compositions, he received inspiration from a Chinese theater he visited in San Francisco and decided, “to write a free fantasy in the Chinese manner”. The song is short but lively and energetic with a brief intermission of sweet melody playing from the violins and flutes. At the concert, three screens were used to depict each scene at a different angle. One scene was of the family mourning for the lost of their husband, the daughter and mother both dressed in special attire singing loudly while rocking back and forth holding a rug. At one point, the mother’s tears give her a temporary pause while the daughter continued. In another scene, the mother and daughter are reading from the book and take turns reciting certain poems. At one of the last scenes, the cinematography captured the beautiful landscape of the village on a hill, the bridge that crosses over the nearby river and the various pathways inside the village. Near the finale, the longest clip depicts the women as they wash their clothes near the river while a young girl rowed her small boat and began making music with the splashes of the water. The whole scene of washing clothes became musical as sounds and clips were cut or zoomed in as the women sang. The symphony itself matched the mood of each clip, making the villagers and ambience of the place come alive in the concert hall. 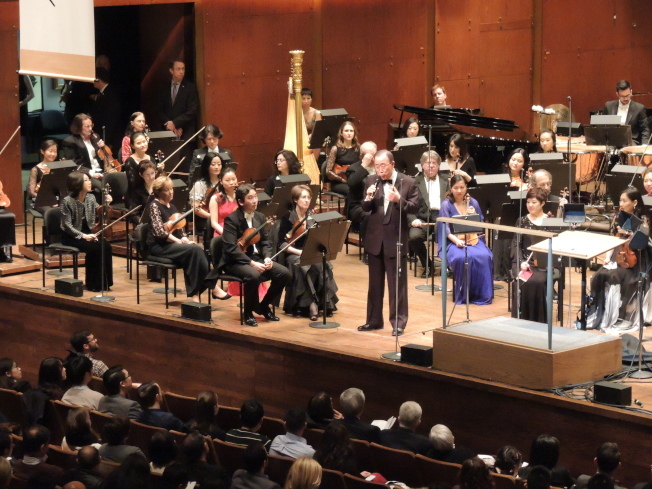 The 2016 Chinese New Year Concert was full of amazing and talented musicians who truly ushered not only inspiration and creativity but truly delivered the message of hope for a prosperous and joyous new year!